The introduction of contactless payment transaction method has provided benefits for all the consumers, merchants and issuers. Contactless payment transaction performs at 60% more faster rate as compared to cash and traditional magnetic stripe cards. This is primarily contributing in gaining popularity for contactless payment transaction method across the globe. Usage of contactless payment transaction method is increased by 20 to 30% over cash payment method in past few years. Preference of digital wallet over traditional or cash payment method is becoming a latest trend and is expected to impact the growth of cashless payment transaction market in the near future. Moreover, progressive acceptance of cloud computing is facilitating IT services results in the development of contactless payment transaction solutions. Government bodies are more inclined towards the adoption of cloud computing to facilitate with flexible services for contactless transactions. Government is also introducing policies for contactless transactions owing to its dynamic functionalities. For instance, Canadian government is focusing more towards the adoption of contactless transaction. With the implementation of contactless transaction method, it was reported that over 70% of contactless payment services were offered by retailers of Canada in 2015. The global contactless payment transaction market is projected to rise from USD 49.7 billion in 2016 to USD 776.4 billion at a CAGR of 41.0 % by the end of 2024. Based on geography, Europe is the dominating market and accounted for 55% revenue share of the global contactless payment transaction market in 2015. In 2016, more than 3 billion contactless transactions were made by the European customers. The adoption of the wearable technology has become the traction for the major countries such as Australia, the UK and the U.S. As compared to other countries, Australia is more focused towards the reception of digital electronics. In 2015, 40% of Australian population has adopted for wearable technology, whereas 22% of UK and US population were accounted for the use of this technology. 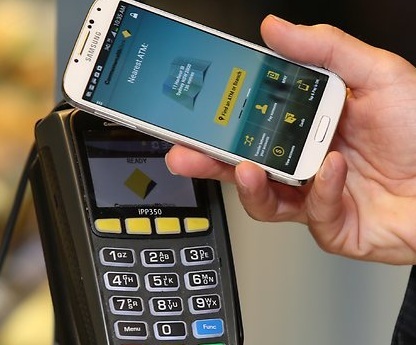 Asia-Pacific is the fastest growing region for contactless payment transaction market. Growing adaptation of digitization in India is driving e-commerce market and has shown 40% increase in digital transaction in past three years. E-Commerce market is showing tremendous growth in Latin America as compared to the North America due to rising adoption of digital technologies in countries such as Brazil, Columbia, Argentina and Mexico. However North America is expected to grow at faster rate during the forecast period and accounted for the 15% revenue share of global contactless payment transaction market in 2015. Fast transaction helps in time saving and reduces the stress for being in the queue. Usage of mobile wallets has made the transaction easier. It is also promoting “Tap and Go” services and helping in the reduction of cash payment management. Streamline payment is making operation handling more efficient. These factors are propelling the demand for contactless payment transaction method among consumers.